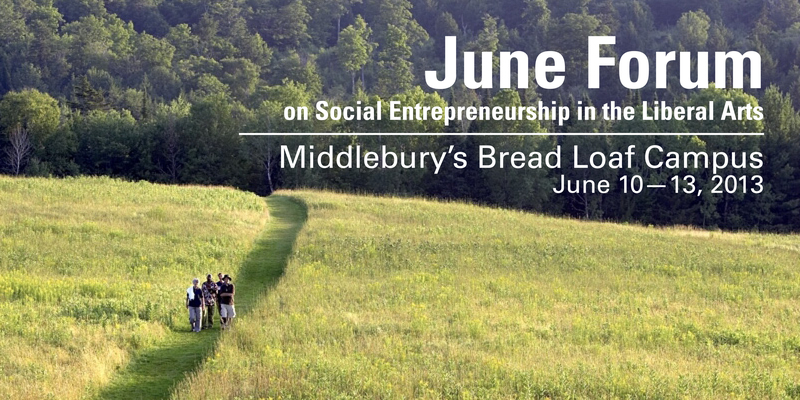 In June 2012, the Middlebury Center for Social Entrepreneurship hosted a forum on social entrepreneurship in the liberal arts at Middlebury College’s Bread Loaf campus. Staff and faculty from 17 colleges and universities gathered for three days to discuss goals for transforming their institutions. From June 10-13, 2013 the center will host its second forum title Social Entrepreneurship in the Liberal Arts: What’s Working and What Isn’t? The focus of this forum will be to discuss lessons learned and will be an opportunity for institutions to learn from one another’s best practices. For more information on the forum, visit our website. REGISTER NOW for the Forum. Follow this link to register through the Middlebury College BoxOffice. The event is titled “Social Entrepreneurship Forum.” Early Bird registration is available until May 1. The early bird cost for the forum is $475. After May 1, the cost will rise to $575. The registration cost includes registration fees, food, housing at the Bread Loaf Campus, and materials. For Middlebury Faculty and Staff members, the forum registration cost is $275 but does not include housing at the Bread Loaf campus. To receive updates once pertinent information becomes available, please fill out this form. On the form, you may also indicate if you would like to lead a workshop and what you hope to explore at the forum. For specific questions about the forum, please email hneuwirth@middlebury.edu. This entry was posted in Midd Blogosphere and tagged Bread Loaf, For Faculty, For Staff, Forum, Social Entrepreneurship on April 18, 2013 by Supriti Ghosh. Follow this link to register through the Middlebury College BoxOffice. The event is titled “Social Entrepreneurship Forum.” Early Bird registration is available until April 15. The early bird cost for the forum is $475. After April 15, the cost will rise to $575. The registration cost includes registration fees, food, housing at the Bread Loaf Campus, and materials. For Middlebury Faculty and Staff members, the forum registration cost is $275 but does not include housing at the Bread Loaf campus. This entry was posted in Midd Blogosphere and tagged Bread Loaf, For Faculty, For Staff, Forum, Social Entrepreneurship on April 5, 2013 by Supriti Ghosh. This entry was posted in Midd Blogosphere and tagged For Faculty, For Staff, funding, grants, Middlebury Center for Social Entrepreneurship, summer on March 15, 2013 by Supriti Ghosh.